Consumers have become accustomed to receiving free shipping for their purchases and getting their packages within a few days. That sets high expectations when it comes to shipping speed and prices. This is something that won’t stop a large business, but it creates a tough situation for small business owners. If one is able to meet these expectations though, then they create incredible customer experiences and turn shoppers into lifelong customers. Meeting these demands takes a little behind-the-scenes magic, but it is possible. Retailers need to refine their shipping strategies and streamline their processes for order fulfilment and delivery. Things are made even more challenging when you consider that you have to do this without increasing prices to the point you can’t do business. The good news is that everything is easier when you choose a good shipping partner. Shipping speeds and costs are an essential part of the formula for customer loyalty. Most customers will choose free shipping over fast shipping, but services like Amazon and eBay are beginning to bring the two options together and provide fast AND free shipping. There’s a lot of competition when it comes to running an e-commerce store, and so you need to have a pricing structure that can compete with the big and small names alike. 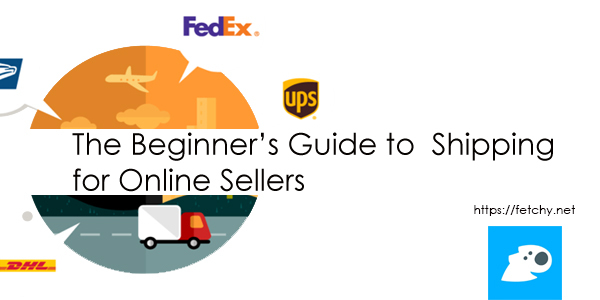 Whether you’ve just started your business and aren’t sure where to get started, or you’re looking for a more efficient way to get things done, we’ve put together this beginner’s guide to ecommerce shipping to help. Many businesses will start with the most well-known shipping vendors; the really big names like Royal Mail. They feel established and trusted, and you might be shipping enough to justify the cost. However, you will need a multi-vendor, multi-step shipping arrangement when your business grows. These ensure that you can continue to offer high speed deliveries. One shipping carrier might sound like a good idea, but that doesn’t make it the most cost-effective one. Small businesses should find the right mixture of shipping options to meet their needs. Another great choice for shipping for e-commerce businesses is Fetchy. Fetchy is an online shipping tool for e-commerce sellers. They offer shipping price comparisons from the biggest courier names across the world, up to 70% off of regular shipping prices, automated shipping, and fast and full integration with an ecommerce store – whether it’s on eBay, WooCommerce, Wix, Shopify, or any other platform. Try it on https://www.fetchy.net/lp. Establishing smart and strategic relationships, and leveraging technology helps small businesses to combine price and convenience. Small businesses need to act like big businesses and do things systematically to reduce their shipping costs and time. Don’t forget to negotiate. Compare pricing for different carriers and try to talk them down before choosing the right one for you. FedEx and UPS have their own dimensional pricing models, which means that shipping costs will be determined by package weight and size for ground shipments. This is a key reason why businesses will adapt and optimize their packaging; both for safety and density and choosing the best box for the package. If you’re planning on shipping several items on a shrink-wrapped pallet, then you need to label the individual boxes in case the load gets broken up before reaching its destination. It can also help to consider assembling products and kitting them beforehand to expedite shipping. You may even find that the cheapest method of shipping might be to have private carriers take the package part-way and then have another service complete the delivery. Managing the shipping process has never been easier thanks to the latest advances in technology. All businesses are now able to monitor their shipments at any stage of the journey, allowing them to provide customers with timely and accurate updates on their packages. It’s not just customers that benefit from this awareness either. It also means businesses aren’t held liable for any delays, errors, or damage that happens after products are shipped. Traditionally, when customers would report receiving the wrong product or that it was damaged, you would have to take their word for it. These days, businesses have access to video surveillance, real time tracking and scanning, and other analytics tools across the entire supply chain. Another important ability is being able to provide customers with tracking details. Customers want to keep track of where their packages are. Businesses should endeavour to have orders packed and shipped within 24 hours and provide customers with tracking numbers as soon as possible. Retailers should regularly evaluate their shipping strategy – such as once every six months – to ensure that they are as efficient and valuable as possible. Continuing to collect data and analytics is an important part of the process. Shipping needs to be good value for money, both for you and customers. Ultimately though, the expectations of customers should be the heart of every shipping decision your business makes. Choosing a carrier that can save you some money but offers poor service will damage your business in the long-run. The cheapest option isn’t always the best one. Keep this in mind when putting together a shipping. Checkout our friends at Fetchy.net and save time and money choosing shipping that works for you. This is a free service for so, there is nothing to lose but a lot to gain.